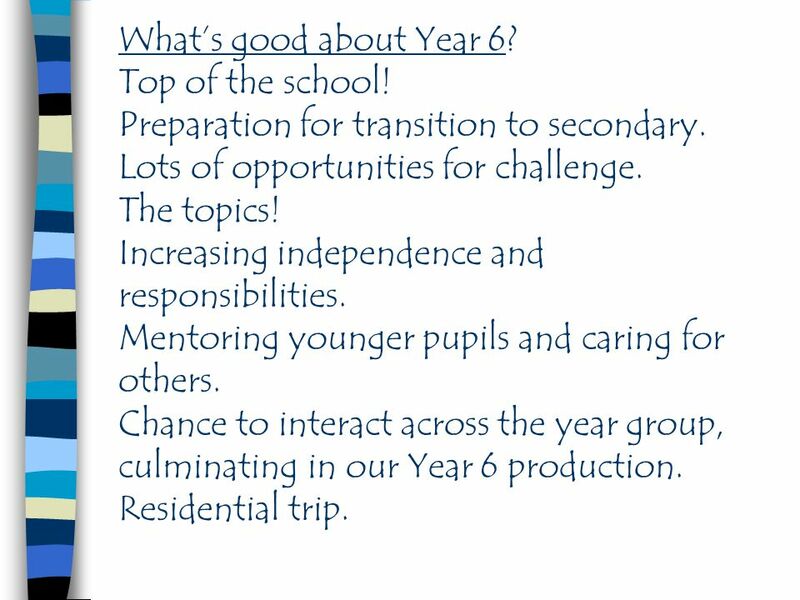 What’s good about Year 6? Top of the school! Preparation for transition to secondary. Lots of opportunities for challenge. 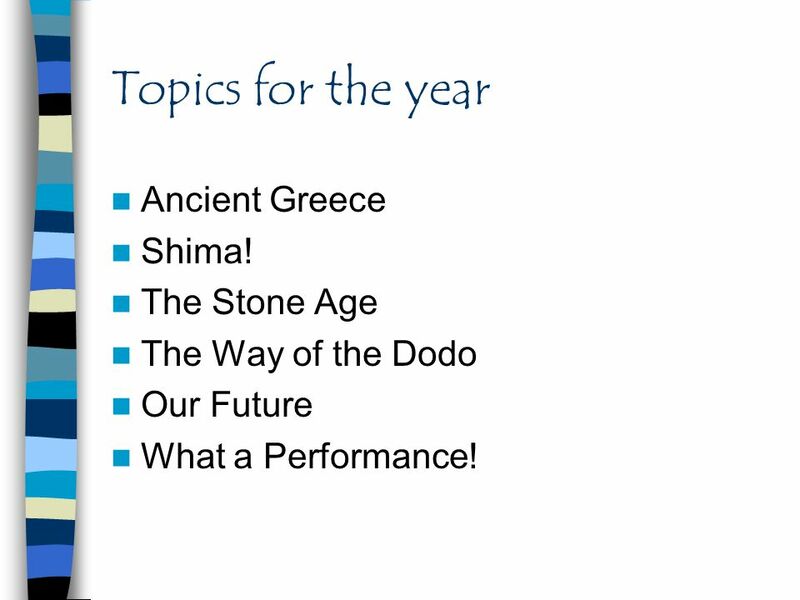 The topics! Increasing independence and responsibilities. Mentoring younger pupils and caring for others. 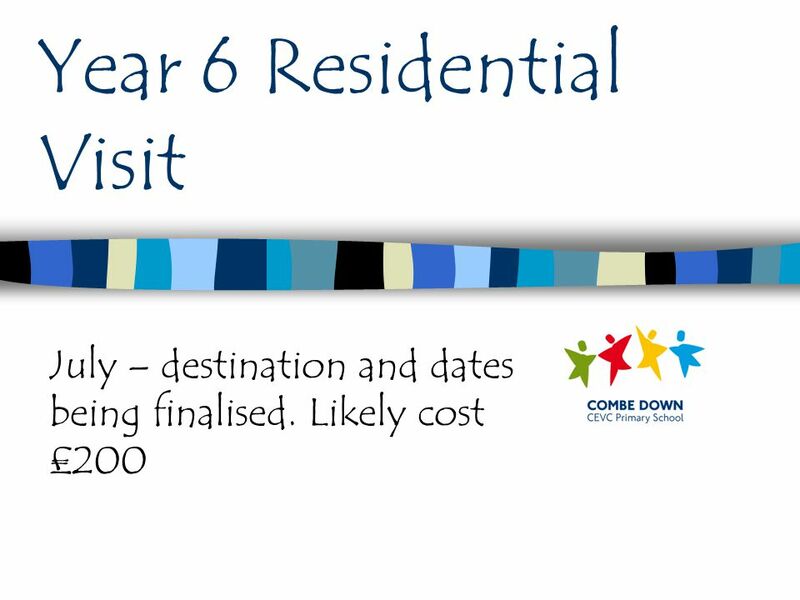 Chance to interact across the year group, culminating in our Year 6 production. 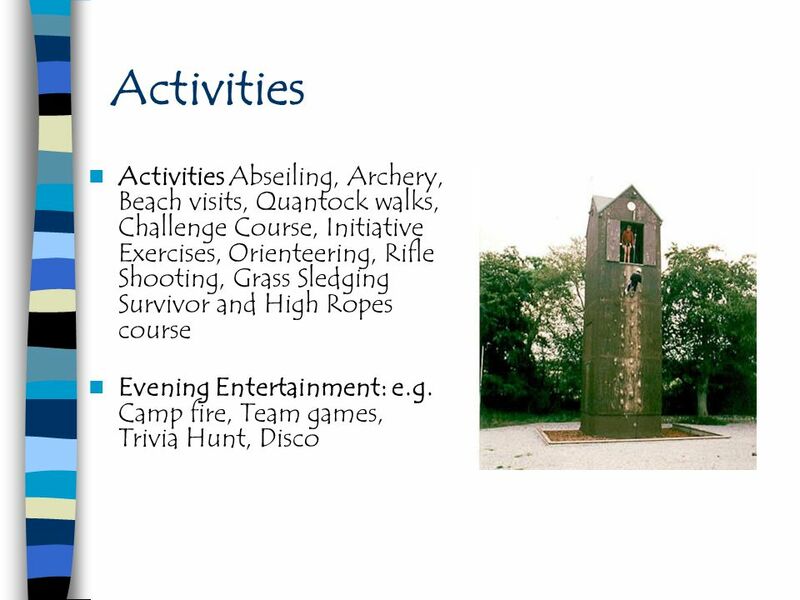 Residential trip. The Way of the Dodo Our Future What a Performance! 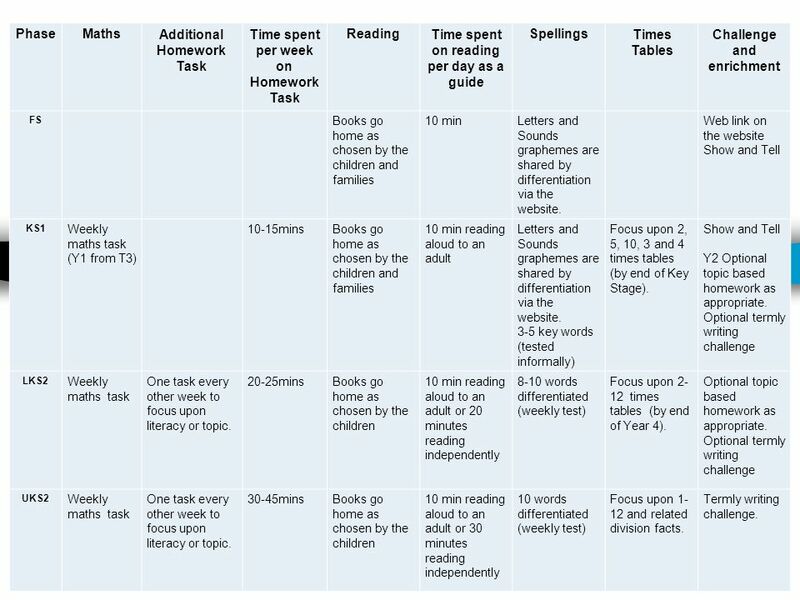 Phase Maths Additional Homework Task Time spent per week on Homework Task Reading Time spent on reading per day as a guide Spellings Times Tables Challenge and enrichment FS Books go home as chosen by the children and families 10 min Letters and Sounds graphemes are shared by differentiation via the website. 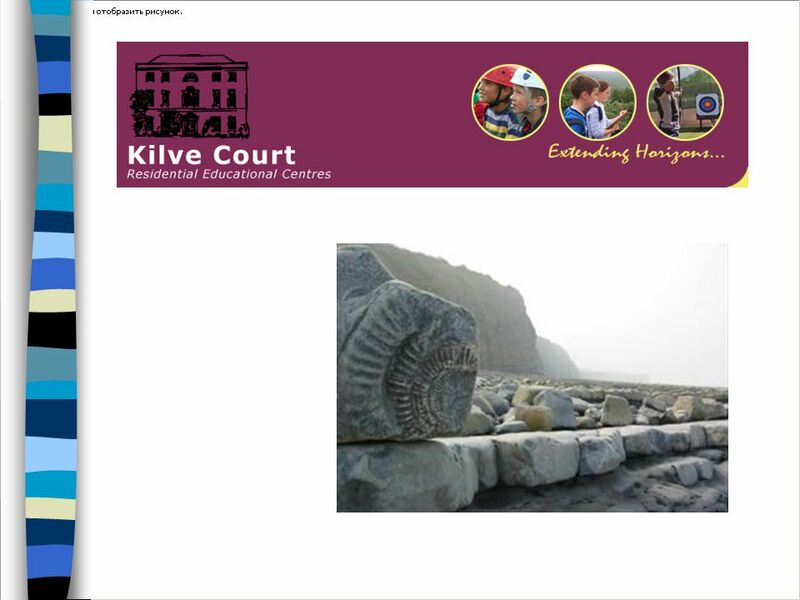 Web link on the website Show and Tell KS1 Weekly maths task (Y1 from T3) 10-15mins 10 min reading aloud to an adult 3-5 key words (tested informally) Focus upon 2, 5, 10, 3 and 4 times tables (by end of Key Stage). Y2 Optional topic based homework as appropriate. 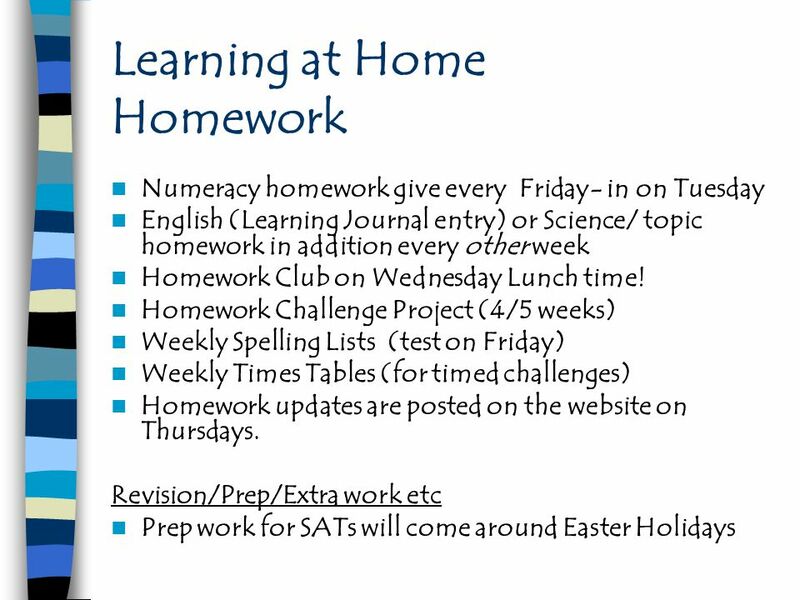 Optional termly writing challenge LKS2 Weekly maths task One task every other week to focus upon literacy or topic. 20-25mins Books go home as chosen by the children 10 min reading aloud to an adult or 20 minutes reading independently 8-10 words differentiated (weekly test) Focus upon times tables (by end of Year 4). Optional topic based homework as appropriate. 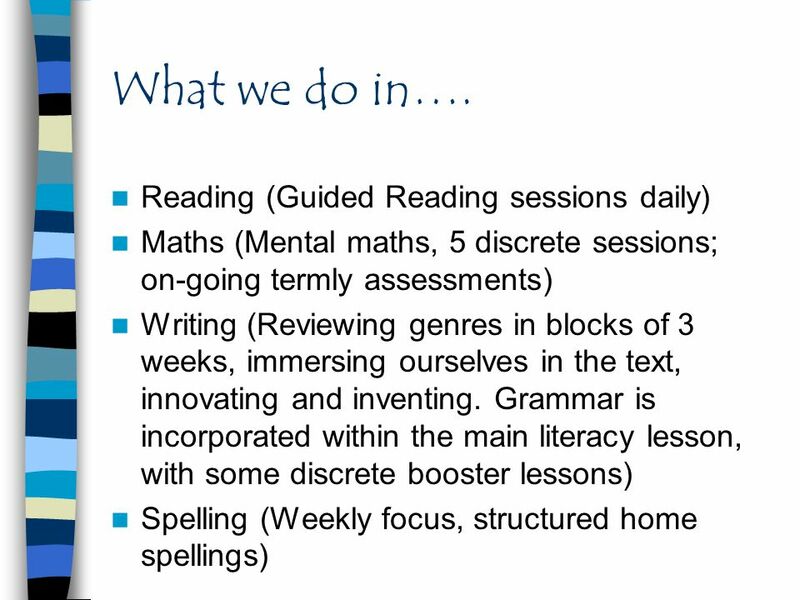 UKS2 30-45mins 10 min reading aloud to an adult or 30 minutes reading independently 10 words differentiated Focus upon 1-12 and related division facts. Termly writing challenge. 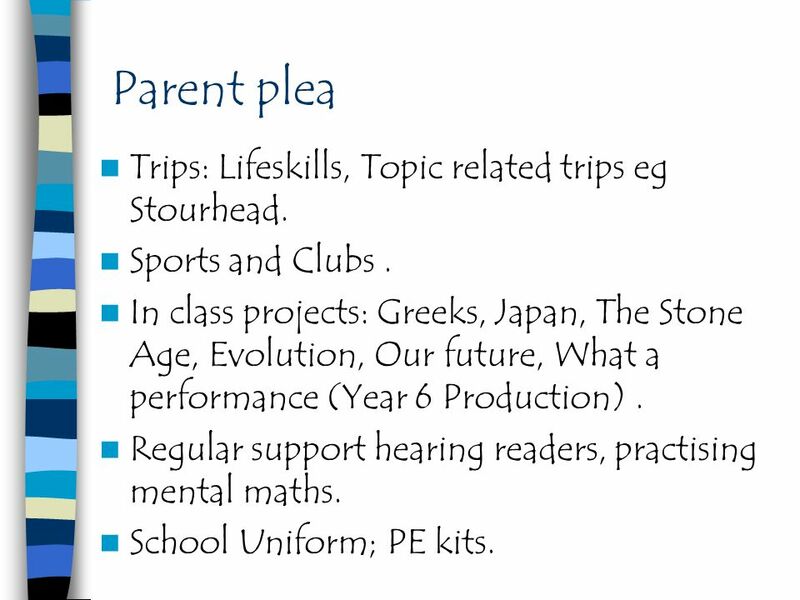 9 Parent plea Trips: Lifeskills, Topic related trips eg Stourhead. Sports and Clubs . In class projects: Greeks, Japan, The Stone Age, Evolution, Our future, What a performance (Year 6 Production) . Regular support hearing readers, practising mental maths. School Uniform; PE kits. 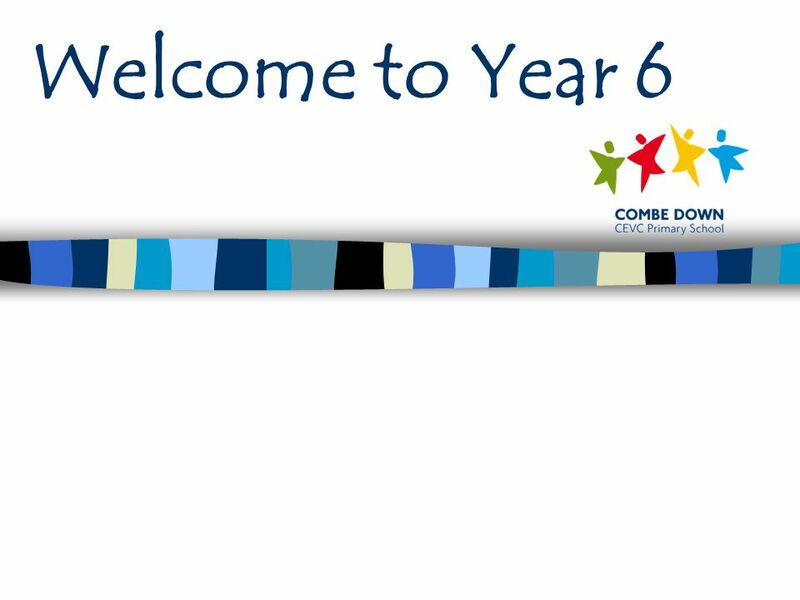 Download ppt "Welcome to Year 6." Welcome to Year 5. Maldives Mrs Vicki Hurst & Mrs Sara Elsworth. Transition Year 2 – Year 3 William Read Primary School Your child will have settled into the school routines and you will be aware of many of our school. Thank you for your time.. Year Group Staff In 6SC are Miss Clemmence and Mrs Kelleher. In 6KH are Miss Hartshorne and Mrs Duggan. Mrs Grady and Mrs Atkinson. Year 2 Curriculum Evening Wednesday 25 th September 2013. Welcome to Year 3 Information Evening Tuesday 17 th September 2013. Lower Key Stage Two Expectations in Year 3 and 4. Meet the Year 1 team. 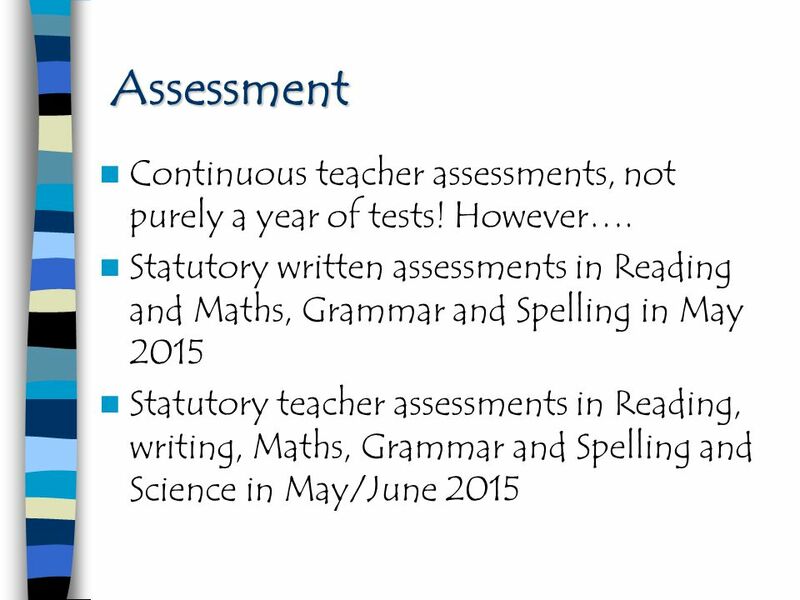 A Parent’s Guide to Key Stage Two SATs A Parent’s Guide to Key Stage Two SATs. 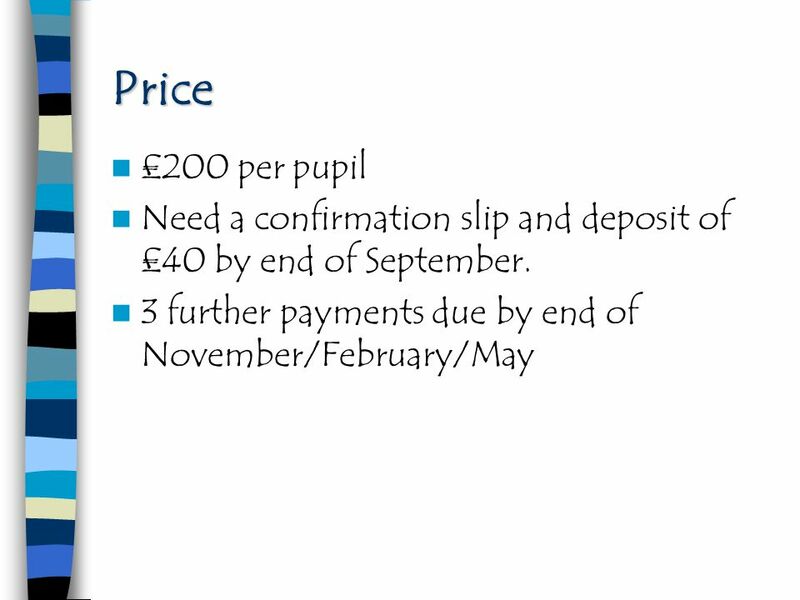 Key Stage 1 Information for Parents Autumn 2013-Year 1 Willow. Curriculum Meeting Year 6 Welcome to the Dragonfly Class. Parents’ Information Meeting KS2 SATS 2015 Wednesday 25 th March 2015 Welcome and please take some time to look at a sample of the test papers that are. PARENTS’ INFORMATION MEETING – KS2 SATS Wednesday 9 th April 2014. Monday 27 th January  To share information about the Year 6 SATs  To explain how the SATs will run in school  To give you information about how. Transition from Year 1 to Year 2. The Curriculum Children have been following the new National Curriculum for Year 1. This has prepared them well for. Transition from Reception to Year 1. Transition Gradual changes introduced into classroom activities and routines. Tailored to meet the needs of each. Welcome to Sycamore Class Yr 1 and 2 Teacher: Miss Devonport Teaching Assistants: Mrs Lamoury, Mr Harrison. Welcome to ‘Meet the Teacher’ Evening Elm, Birch and Chestnut Classes 17th September 2015.